Expert juicer-maker Juicy Retreats has unveiled its new compact juicer that takes things slow to ensure you get the tastiest, fruitiest juice with your brekkie. JR Purusis the slowest rotating juicer in the world, running at only 30rpm.And slower is better when it comes to squashing your favourite fruit and veg, as all the essential nutrients stay in the juice – and nutritious juice is tasty juice so everyone's a winner. Slower rotation creates less foam, less heat, and a more enzyme-rich juice which has the benefit of lasting longer – the juice can stay fresh in the fridge for a couple of days due to the serene nature of its creation. Unusually for a slimline juicer, JR Purus has an AC motor, making it more reliable than other compact juicers with DC motors. And – joy upon joys – cleaning is easier too, thanks to its unique 3-in-1 juicing system. The auger, filter and wipers, which are usually separate in full-sized juicers, come as one easily washable part in the Purus, which not only makes less parts to clean but, according to Juicy Retreats, creates a less pulpy juice. 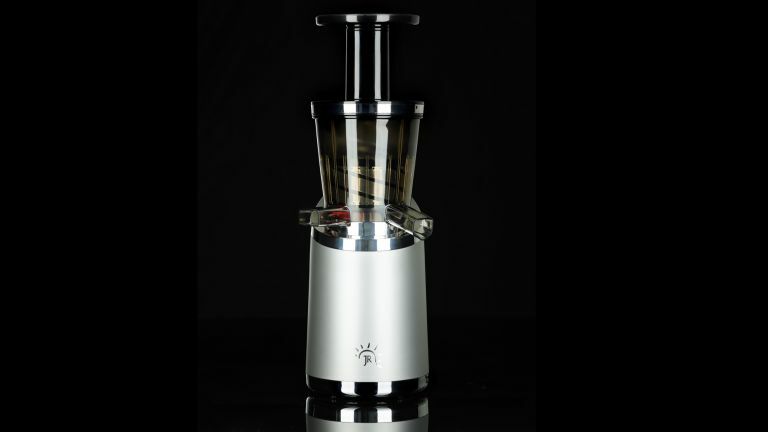 We've tried it out and it is much easier to use than traditional juicers while still creating tastebud-tingling juices. JR Purus can also create frozen desserts and smoothies, and comes in either silver or black so as to look at home in any techy kitchen. You can get hold of it for £289, and you can save 40% right now on the Juicy Retreats website.